Haaker Equipment Company arms you with the power and efficiency of highly acclaimed Elgin Street Sweeper units. 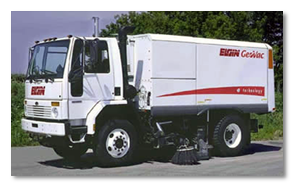 Elgin has been the premier maker of top-caliber street sweepers for more than nine decades and is recognized by the industry as one of the leading makers of the best pure vacuum and regenerative air sweepers. Haaker takes pride in being among the most established dealers of Elgin’s reliable and diverse array of street sweeping equipment, especially Elgin’s Air Street Sweeper line—the Crosswind, GeoVac, and Whirlwind. We offer and service brand-new sweeping units and parts, but we also have rental, re-manufactured, and pre-owned Elgin Air Street Sweepers that you can choose from. You can visit our headquarters in California or our branch office in Nevada to find out what your options are for purchasing or renting Elgin equipment. 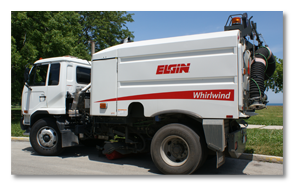 An amazing street sweeper of the highest caliber, functionality, productivity, and versatility, Elgin’s Crosswind enables municipalities, industries, and contractors to efficiently accomplish their tasks. The Crosswind is operated straightforwardly using rocker switches and includes a full set of the essential gauges. This remarkable unit can perform for extended periods in fueling, dumping, and re-watering sites thanks to its outstanding fuel-efficiency and large and strategically combined water tank and hopper. It can also thoroughly clean larger and flat paved zones like airport runways, parking lots, and streets with its heavy-duty recirculating vacuum sweeper. You will enjoy operating it—as do public work officials and contractors—because of its ergonomic structure, enabling you to work safely and comfortably. Elgin’s Crosswind is also easy to maintain so you can allot extra time to more important tasks. Featuring a full 8.5-foot sweep, an 8-cubic yard hopper, and a 330-gallon water capacity for dust suppression, Elgin's GeoVac is a silent but efficient cleaner perfect for construction and industrial sites, parking lots, and streets. It utilizes the ingenious combo of very low dB(A) drive-by and in-cab noise levels and top-caliber vacuum sweeping, as well as the power and efficiency of a 99 hp John Deere® Tier 2 auxiliary engine. It is easy to operate using direct-touch rocker switches, is very accessible because of its button-triggered automatic full-width gull wing doors and easy-to-store ladder, and is conveniently simple to maintain with the help of the included service module. The GeoVac focuses suction power in the nozzle while the strong airflow it creates transfers debris inside the structure. The extension and side brooms under the machine enable it to efficiently sweep any debris into the nozzle's area of effect. 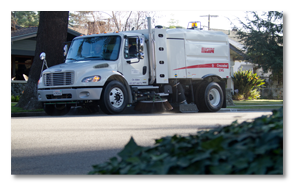 Generally for catch basin cleaning and street sweeping, Elgin’s Whirlwind is customizable and sure to address your needs. Having passed the strict PM10 rule 1186 evaluation, it reliably delivers high quality versatility and pickup. Providing a short wheelbase, wider sweep, extending nozzle, and low maintenance structure, the Whirlwind’s overall make is something that you can truly find advantageous and useful for your needs.